What is a Juvenile Society? In 1967 Philip Amey and Peter Earl both had their bonfires destroyed before 5th November. They decided to build one big bonfire, made 50 torches and invited 40 friends to join them in a single procession from the rear of Highdown Road to the allotments beside the Motor Road. A large bonfire had been built and they let off fireworks with a small set piece of a windmill made by Charlie Earl. 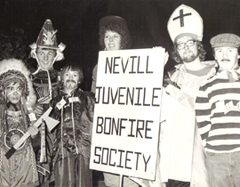 Nevill Juvenile Bonfire Society was formed. The following year, 70 members in seven processions took to the roads on the Nevill Estate with a band. A small fireworks display, including the race to the moon, took place close to the field currently used today. Following the celebrations a committee was formed on 17th December with separate Captains for Effigy and Tableau. Since those early days, the Society has grown every year to what it is today with over 400 members with a whole host of visiting Societies on Our Night.